On this blog we like to celebrate all kinds of cycling—mountain biking, road biking, recreational rides—but bike commuting is without a doubt the most environmentally-friendly, responsible use of a bicycle. Lots of folks use a bicycle to get to work or to the grocery store, but throw a child into the mix and things get more complicated. Here are some of our tips on using a bicycle for transport with kids in tow. Add extra time to your commute. If it would normally take you 30 minutes to bike somewhere, budget for 45 minutes when doing it with kids. Guaranteed someone is going to need a snack, a potty break, or a clothing adjustment. A time buffer also allows you to take a safer, potentially less-direct route than you would normally take. There is no one setup to make the bike commuting thing work. If you’re just getting into the game, a bike seat, trailer, or trailer-cycle are excellent and affordable options. Both front and rear mounted bike seats work well for kids. Trailers have the benefit of not only hauling kids but gear as well–I love using my Chariot for hauling groceries and library books. Finally, for older kids who are able to pedal but maybe can’t ride the long distances you need to commute, a trailer-cycle allows them to pedal along but get a boost. As opposed to having them on their own bike, it also lets you keep them close by which is nice for riding in traffic. If you are using a bicycle as one of your primary modes of transportation, consider investing in a cargo bike or long-tail bike. These bikes allow you to haul kids as well as school gear, work clothes, groceries, and more. In any case, you might want to consider panniers for loading your work gear and kids daycare bags. It’s not as popular, but I also like riding with a good old backpack. If you live in a rainy or snowy area, consider a dry bag like this one. When mapping out a Sunday afternoon ride, it’s easy to pick a bike path or rail trail to bike with minimal traffic. When bike commuting, however, you have a definite Point A and Point B which makes finding traffic-free routes challenging or impossible. You should always choose the safest route possible, but when faced with less than desirable conditions, it becomes especially important to make sure you’re visible. Add reflective tape to your bike and whatever carrier you are using for your child. Consider adding reflective tape to your helmets as well. When riding in low-light conditions, make sure to use both front and rear lights. If riding with your child in a trailer, make sure to add a safety flag and lights to the trailer as well. For other ideas, read our safety tips for biking with kids. There is nothing worse than a cold or wet, whiny toddler. When bike commuting, clothing choice is infinitely more important than in an air conditioned, heat-controlled minivan. Make sure to invest in high-quality rain gear and cold weather gear for your child. For particularly cold weather riding, check out our guide to Winter Biking with Kids. This goes for you and the kids. Not only does it drastically improve your chances of surviving a fall or collision, it might be the law in your area. If you need help picking out a good helmet for your child, read my post on the best bike helmets for young children. Yes, you just fed your children a nutritious and filling breakfast. Nonetheless, if they are like mine, your kiddos will start begging for food and/or water about half-way thru your commute. Stash some snacks in a pannier for when the going gets rough. Nothing keeps a child entertained for a long bike ride like a snack. Making bike commuting fun is key to having cooperative kids. When I’m with my son, we like to sing songs or play a game of “I spy.” A good old cheap bike bell can provide lots of entertainment too. The single most important thing when bike commuting with your children is feeling safe. If you don’t feel safe, you probably wont keep at it for long. If you’re not already familiar with the bike routes in your community, spend some time getting familiar with them before taking on any long commutes. Google a bike map for your city. Do a test run sans kids looking for low-traffic backroads. And if you find that there really aren’t any great roads, become an advocate for safer cycling in your community. There’s no doubt that biking is a more sustainable option than driving. Young children are particularly impressionable, and by learning to bike and a young age they are more likely to view it as the norm for the rest of their lives. One of my favorite parts of biking with my son is chatting with him. We can talk about our day just like we do in the car, but we also tend to talk about what we see. Compared to driving, biking is much more interactive with the world around us. We might talk about the weather, about people and animals we see, and the sounds all around us. 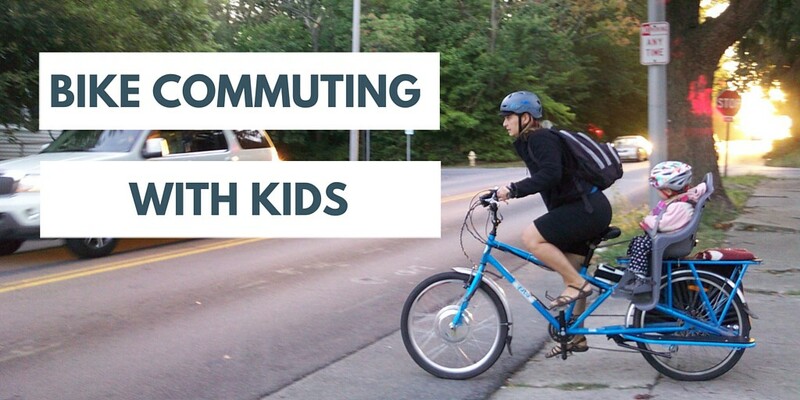 Mom and dad can often forgo the gym just by biking the kids to school and themselves to work. Hauling kids and gear is great exercise, and makes for a healthy lifestyle. Once kids are old enough to pedal themselves, its also good exercise for them. Bike commuting is a bit of work, but totally worth it. What tips do you have for bike commuting with kids? Thanks so much for the fantastic tips. I 100% agree on the bell. We have one on every set-up we use with our son, and it provides lots of fun and entertainment. He’s just starting to do some simple math, so we will have to try that as well. Cheers.